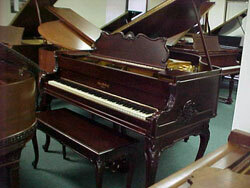 SCROLL DOWN TO SEE ALL OF OUR PIANOS ! SUPER SALE PRICES BELOW ! 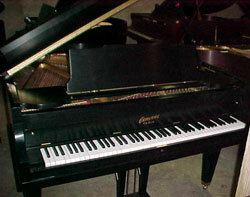 COMPUTER PLAYER SYSTEMS AVAILABLE FOR ANY OF OUR PIANOS ! 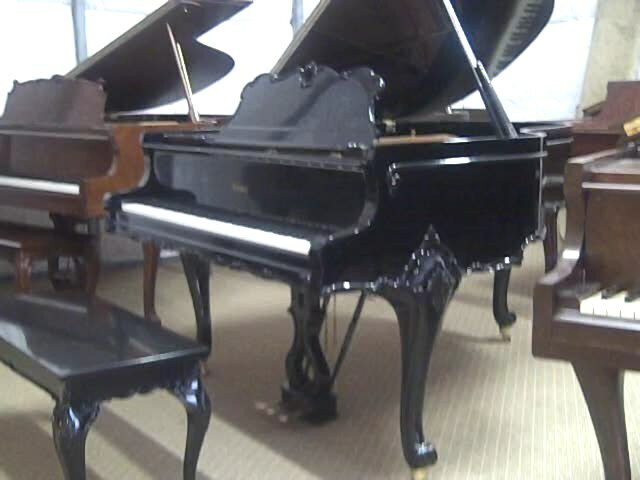 Schaff Piano is now Schaff Piano Supply Company which is one of the largest distributors of piano supplies to piano rebuilders across the country. Traditional styled. 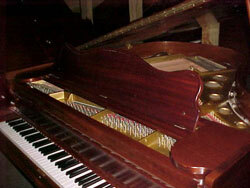 Pianos are rebuilt with new finishes, strings and pin blocks. Circa 1950's. In the many years I've been locating art case grands, I've never seen one like this before. It is truly magnificent! Beautiful music rack, pedal lyre, and gorgeous legs with a matching bench and a Baldwin at that!! 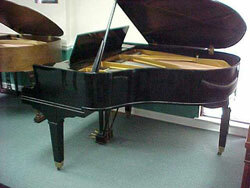 It's completely restored and has a perfect gloss black finish. Traditional styled. 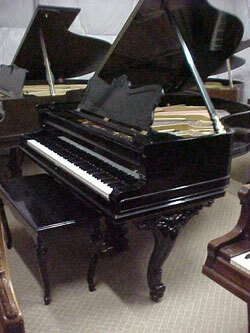 Rebuilt and refinished in gloss black. Traditional styled. 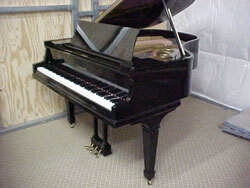 Rebuilt and refinished in satin black. 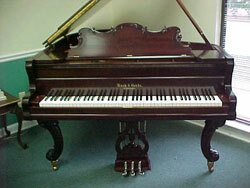 Beautifully restored traditional styled case in polished mahogany. New pin block and new strings and finish. Circa 1920's. Gorgeous large ornate legs and scalloped bottom. A true masterpiece! 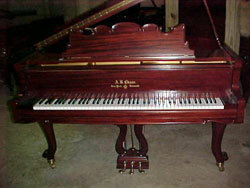 Beautiful mahogany grain. Rebuilt and refinished as usual. Circa 1920's VERY RARE PIECE! new finish, pin block, and strings. Circa between 1900 and 1940. Heavily carved french legs and lyre. Rar Art Case with Roses on Legs! President Warren Harding once owned an A. B. Chase. this A.B. Chase has beautiful roses caved above it's legs! INCLUDES FREE PLAYER SYSTEM ALREADY INSTALLED!! 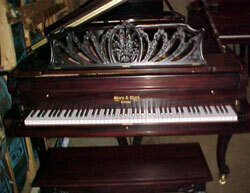 CHECK THIS PIANO OUT! 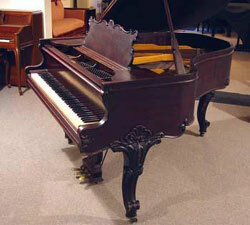 Have you ever seen a more ornate scallopped case than this? We haven't that's for sure. Really unbelievable and a DOUBLE LOUIS at that!! Carved panels on case. Pedals are even carved as well as the BACKS of the legs.. Matching Bench, What more could you ask for? THIS IS THE ONE ! 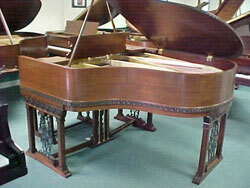 You will not and can not find a more beautiful and rare piano than this. It is truly exotic and extreme!! Just look at the pictures. 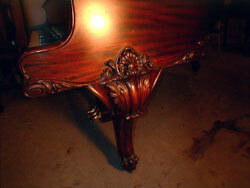 It has a very deep red mahogany finish and has been restored with a new pin block and new strings and finish Double french legs on each corner with carved shoulders and case. If this is not enough, how about the matching carved bench as well? ....what more could you want ! 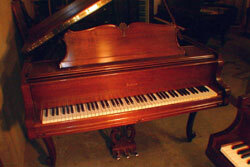 The First American Piano Maker. Once Owned by Abe Lincoln! Traditional styled. 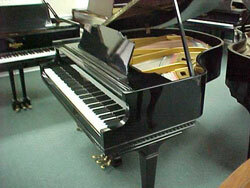 Pianos are rebuilt with new gloss black finishes, strings, pin blocks and hammers. Decorative cabinet style. Circa between 1900 - 1940. 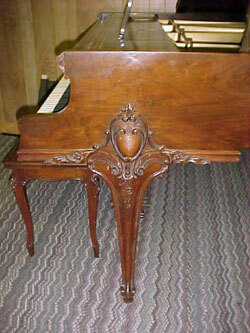 We have several Chickerings in stock ready for custom restoration to match your decor needs. You choose the color! 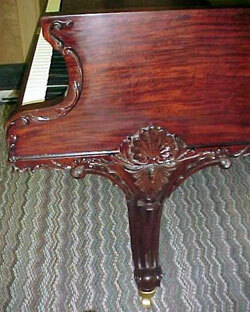 Goegeous Carved cheeks, triple redid legs, and carved reef motif on music rack. Recessed panels on case. Matching Bench. Cabinet is ribbon mahogany. Circa between 1900 and 1940. Round Carved Leg Art Case with carved music rack. 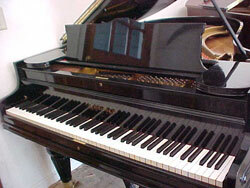 Piano is rebuilt with new gloss black finish, strings, pin block and hammers. Circa between 1900 and 1940. 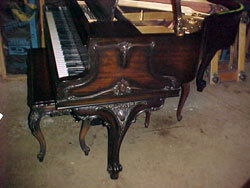 Gorgeous Scalloped bottom art carved grand. 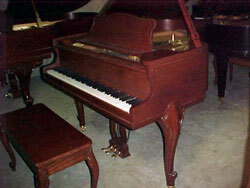 Rebuilt and refinished in Honduras mahogany. Circa 1920 - 1940. Traditional styled in gloss black. New strings block and finish ! Circa between 1900 and 1940. This is one of the rarest Louis XVs we've found. 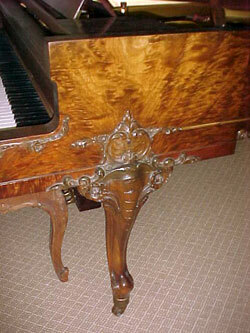 Carved panels on sides of case and wide carved Louis XV legs, pedal lyre, and rack. Unbelievable carved matching bench. 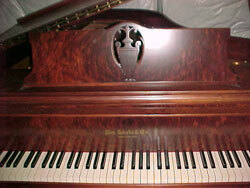 Original sunburst mahogany finish in great shape. New pin block, new strings and plays/sounds like a dream. A true example of fine American craftsmanship at it's peak! 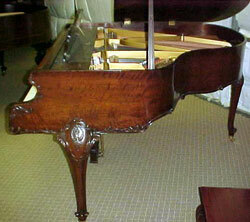 Very rare carved Emerson Louis XV. 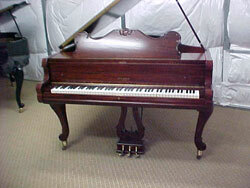 Emserson was one of the American Piano Company's pianos who also made Chikcering, Knabe and many other fine makes. 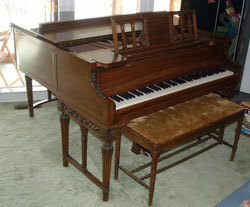 This one has very nice carved legs and a beutiful burled walnut carved music rack and fallboard is burled too. 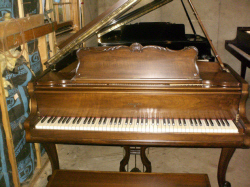 A chance to get a super carved and burled piano for much less. Totally restored with new strings/block/finish/hammers etc. with bench. President Benjamin Harrison owned a J & C. Fischer. Available for restoration and custom colors. 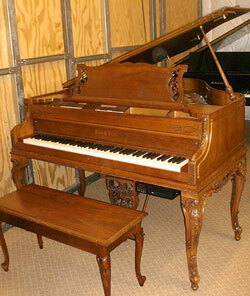 We just purchased this magnificent Fischer Victorian carved grand from a large estate in Colorado. 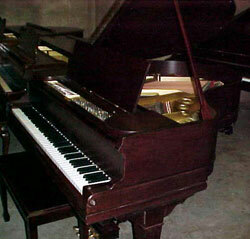 You can choose to have this piano finished in any color. Maybe even gloss black! 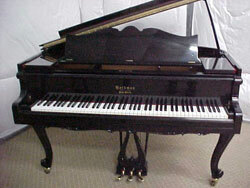 Can you imagine this piano in your living room in gloss black or gloss white? Noone would have anything like it except YOU!! You may choose red or brown or anything you want, but hopefully not pink! 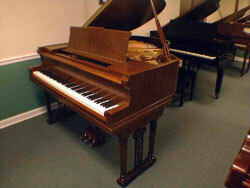 This piano would make a show stopping statement in your home and a great instrument for your pianist. Very elegant Gulbransen Louis XV in burled walnut with highly carved matching bench. 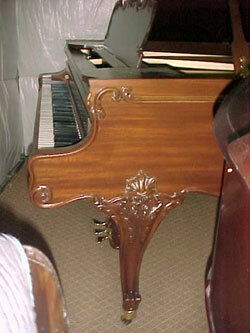 Original finish in a perfect french polish gloss. New strings and new pin block. A REALLY Super find! Built by: Mason & Hamlin! 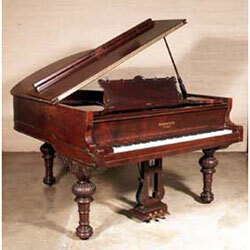 Franklin D. Roosevelt's Choice of Piano! 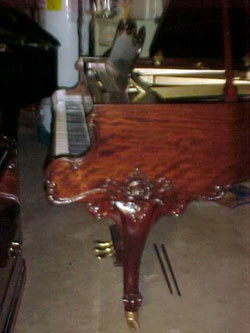 French style legs, music rack and pedal lyre. 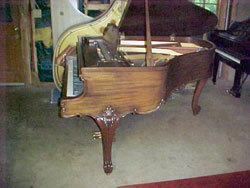 Piano is rebuilt with new finish, strings and pin block. Cabinet is unusual vertical grain walnut. Circa between 1900 and 1940. 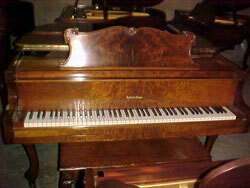 John F. Kennedy's Choice of Piano! Beautiful vertical grain burled walnut. New pin block, new strings, and new finish. Fully Scalloped. 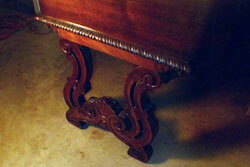 Designer Style Deeply Curved legs on this rare Ivers Louis XV. 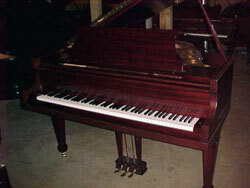 A real rare find in a beautiful deep red Honduras mahogany. 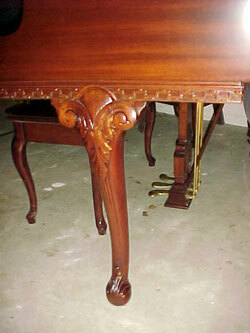 Rare and Exciting Kimball DOUBLE Louis XV with matching bench. Beautiful moulded border around bottom case. 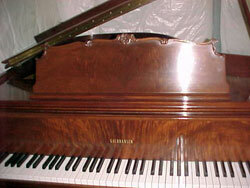 Rebuilt and refinished in a rich dark gunstock brown walnut. Exterior has been finished but we will need to restore the interior. It could be restored within a couple of months time since the finish is already done. It is truly a magnificent piece! Matching bench. in stock Now in Burled Walnut ! One is 5'4"and other is 5'8"
Same cabinet but w/ more exotic wood! Also one in the same cabinet 5'8"
custom coloring to match your decor! 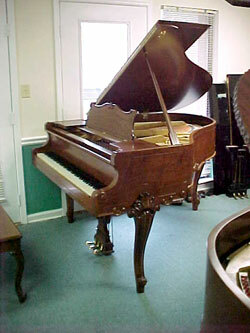 Francis Scott Key who wrote the Star Spangled Banner owned a Knabe Grand Piano as well as Einstein and President Herbert Hoover to name a few. 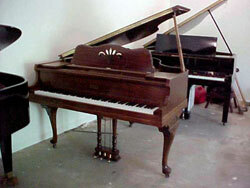 We have several Knabes in stock ready for custom restoration to match your decor needs. You choose the color! 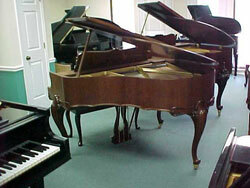 Knabe Grand Pianos Starting at $3500 + Restoration. This is the beautiful limited edition ROSE BUD model Louis XV by Knabe with carved roses anoiting the tops of the cabriolet legs. New pin block, new strings, and new closed grain finish in a pretty and warm medium walnut. Picture for that one on request. we've ever seen. This piano has it all. Burled walnut, matching bench, and truly stunning carved legs. 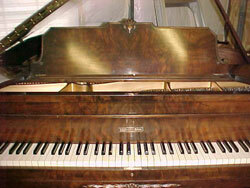 Traditional case Knabe in exotic burled walnut. Exotic carved burled walnut ! 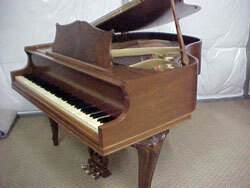 Very Pretty Traditional Styled Mahogany Restored Grand ! LOOK at the Photos ! Unreal burled walnut scalloped Louis !! 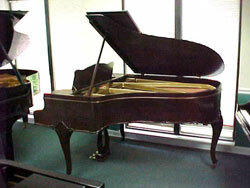 If you ever wanted a Victorian case baby grand this piano beats them all in quality of tone and visual effect. 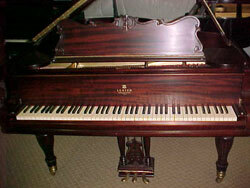 Lester was Official Piano of Philly Orchestra and Opera House! 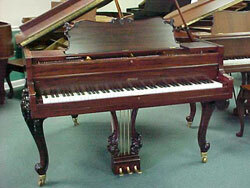 It has a wonderful carved music rack annicely ornamented legs. The pedal lyre is very unusal and stunning! Completely restored to perfection. Extremely Ornate and Unusually Beautiful ! This Spanish/Mediterranean style art case is made by Chickering and has it's matching bench. It's elaborately carved on the lid, case and legs and has decorative cast iron inserts between the legs. Connectors between the pedal lyre and legs. A true ART CASE!! New pin block, new strings, new hammers, and new closed grain finish. Circa between 1920 and 1940. 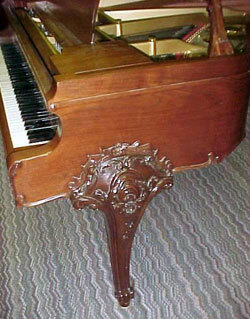 One of our most exotic and heavily carved Louis XV pianos. Thunderous bass on this one. Beautiful scalloping on bottom edge all around cabinet. 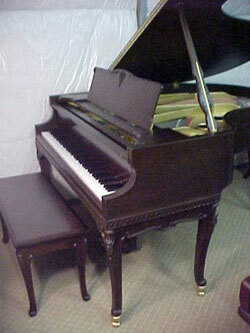 Rebuilt and refinished in a warm rich walnut tone. 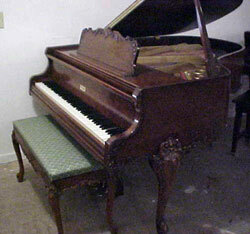 SOLD (To CEO of Napster) Heavily scalloped bottom of case, heavily carved legs, pedal lyre and music rack. 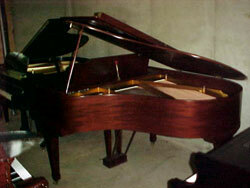 Piano is rebuilt with new finish and strings. Cabinet is flame grain mahogany. Circa between 1900 and 1940. Matching Bench. Restored with new strings and new pin block. Unusual and beautiful heavily carved art case w/rare crotched cut mahogany. 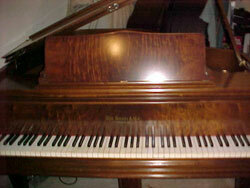 Rebuilt and refinished etc. 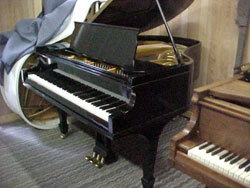 Irving Berlin's choice of pianos. 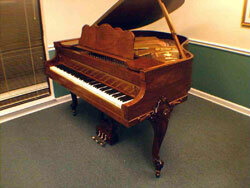 Gorgeous rebuilt and refinished traditional styled Sohmer. music rack holders and matching French leg bench. 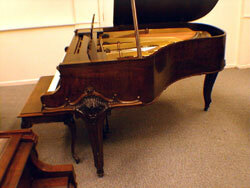 The owner feels this is the most beautiful Louis XV styled case and one of the finest instruments ever made! 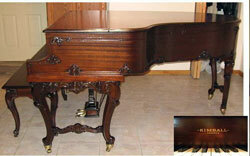 It is available for complete restoration and custom coloring to match your decor. Hurry! This one won't last long at all!!! 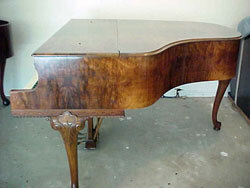 A very rare walnut scalloped bottom beautiful Louis XV. Prized & Favorite Art Case! This is one of the most beautiful art cases we've ever seen. 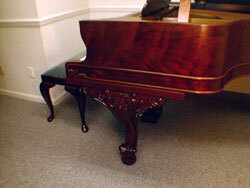 Made of Special Order Walnut with an ornate Dragooning Border around the Bottom and Top of the case. 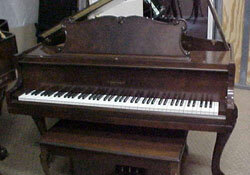 New pin block, new strings, and finish and built between 1920 and 1940. 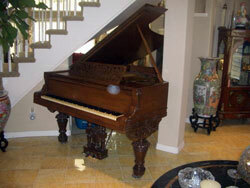 Played many times by Liberace himself!!! Amazing find! 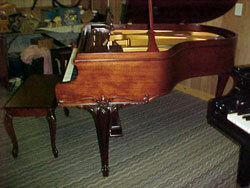 New pin block, new strings, and finished art case with beautiful round carved legs and carved music rack. Came out of one of Liberace's best friend's homes in Tenn. who he visited very often!!! 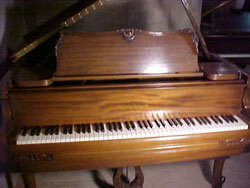 Here is another beautiful Victorian Sohmer. Look at the perfect and still intact lattice music rack. 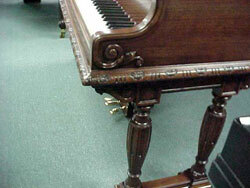 Walnut w/ Gorgeous "Harp" Shaped Legs!! 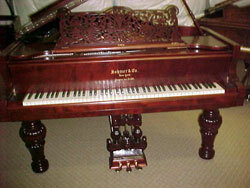 Louis XV w/ carvings on case and music rack. 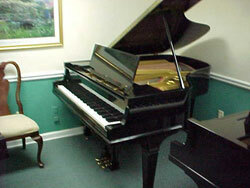 Piano has new finish and strings. 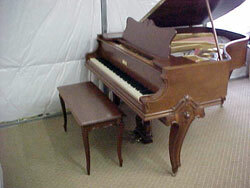 Finished in a Satin Mahogany. ever found. 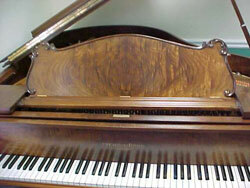 Click on the piano to see larger pictures. You won't believe it. See it for yourself up close. But it would look much better in your own living room wouldn't it?? 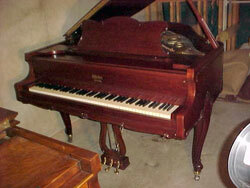 Rebuilt and refinished in a deep dark mahogany. Elegant styled Louis XV with pretty scalloped bottom. Completely rebuilt and refinished! 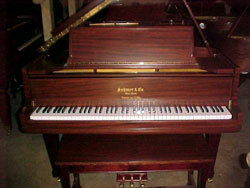 Beautiful rich red mahogany finish. 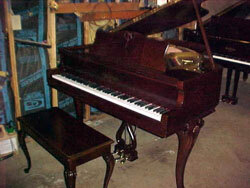 This is an exact copy of the Steinway Louis XV case! Beautifully Carved and Scalloped. Even the lid and music rack are carved and scalloped! Just Completed with new strings and a recent finish in Mahogany.